I want to share a fun and important opportunity with you that I have participated in for the last few years and encourage you to get involved this year. 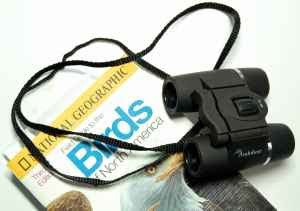 It is the Great Backyard Bird Count (GBBC). Why have I participated? Part of the allure is being able to contribute data as a citizen scientist to a worthwhile research project. Also, I enjoy either watching and counting the birds from my dining room or getting outside to a park or other good bird watching area. I could go on, but there is so much more info by the organizers of this event, that I encourage you read their press release to learn more about how you can help and to see some amazing photos taken during last year’s event. This worthwhile project can be great fun for you and your family, so I hope you will get a chance to participate. Happy counting! 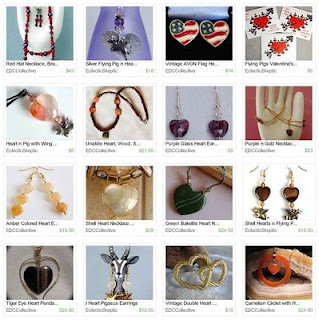 Give your heart to your Valentine with one of the following gifts available from EDCCollective or EclecticSkeptic. (Click on the image to enlarge it.) For more information about an item or to purchase it, head on over to the shop listed under each item. Did you see something you liked, but it needs a cute flying pig charm? Or perhaps it’s the other way around? Many of these items can be made with or without the flying pigs. To see if I can add a flying pig to a featured item, contact me at EclecticSkeptic. For items sans piggies, contact me at EDCCollective. I described in an earlier post how an Etsy alchemy listing led me to include feather wrap pendants to my offerings at EDCCollective. A recent alchemy listing inspired me to add feather hair accessories as well. The title of the alchemy listing was “Native American Necklace and Hair Accessories”. That peaked my interest and I clicked on the request to read the description. I responded with one of my feather wrap pendants and was told that a different style necklace was being looked for, but was asked if I could make something similar in a hair thong? Hair thong, now that was a new term to me, so I did some research on the web and came back to my prospective customer with some ideas and questions. After getting some feedback, I sent a photo of mock ups of three different types of feathers that I had on hand that I thought would lend themselves to this project. My customer liked the design and feathers of the middle one the best, so I proceeded to complete a pair of Native American inspired hair thongs based on it. I liked the way the gray and white feather mock up looked, so I made a couple of pair of hair thongs based on that design for my shop. The third photo in this post shows the completed custom hair thongs as well as the ones for my new shop listing. 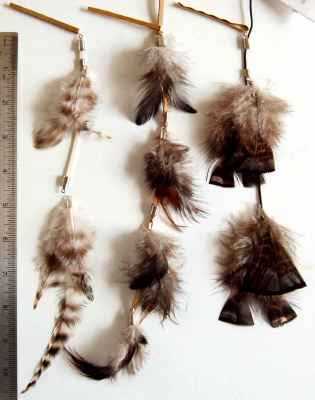 While looking for hair clips for this project, I found some that would compliment other feathers that I had in stock. I used these colorful new clips to create some peacock feather hair accessories. I have really enjoyed working with the feathers and creating these wonderful hair accessories. 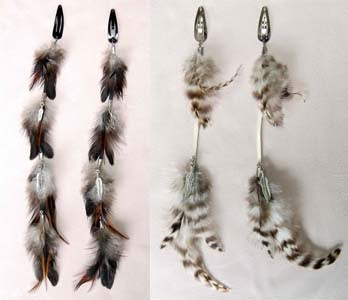 The natural beauty of feathers allows them to be used for a variety of projects. Stay tuned to see what new creation I’m inspired to come up with next. Sometimes you need a card for a specific occasion such as a birthday or holiday greeting and appreciate the preprinted text that comes with it. However, sometimes you want to be able to express yourself without those words getting in the way. That is when you reach for your stack of blank cards. Blank cards are great for sending out thank you, just thinking of you, congratulations and many other messages. If your stack of general purpose blank cards is getting low, Eclectic Design Choices can help. Both EDCCollective’s and EclecticSkeptic’s Etsy shops carry a variety of blank holiday and general purpose cards. 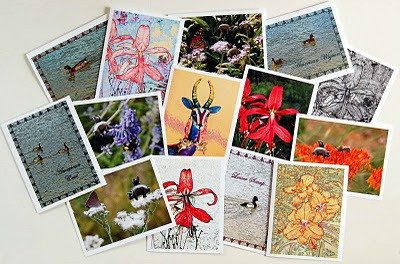 Images on the front of these cards are either my original or altered photos of a variety of subjects. Images in addition to those currently listed may also be available.